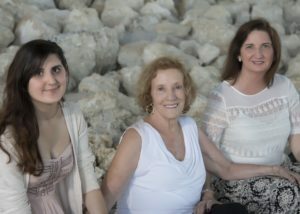 I wanted to share with you the stories of two yoga women, both in their 90’s, whose experience I am very grateful to learn from and hopefully emanate. I had the pleasure of meeting Tao when she came to teach in St. Petersburg last December. This 97 year old yogini has been practicing yoga throughout her life, and her energy is amazing. She spent most of her talk sitting in full lotus position, and then demonstrated poses that would be difficult for those a third of her age! Tao grew up in Pondicherry, India and was raised by her uncle, who was a follower of Swami Vivekananda, a pioneer in bringing yoga to the west. In 1926, when Tao was eight years old, she saw boys doing yoga on the beach and wanted to join them. When her aunt told her that this was unladylike, the defiant Tao joined them anyway! She marched with Gandhi twice, including the 1930 Salt March to the sea. She is one of the first women who studied with acclaimed yoga masters B.K.S. Iyengar and Pattabhi Jois. Famous fitness expert Jack LaLanne gave Tao her first yoga teaching job. She later founded two yoga teacher associations in 1979 and 1982, and since then she has certified over 1600 yoga teachers and has led yoga retreats all over the world. 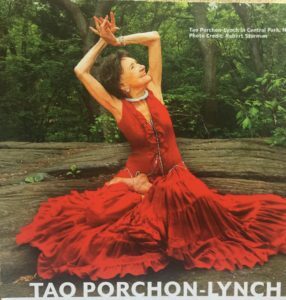 In 2012, Tao was named Oldest Yoga Teacher by the Guinness Book of World Records, and the online videos of her prowess are viewed by thousands. At this writing, I am planning this amazing woman’s 90th birthday party- and she’s having a very hard time letting her kids do all the work! She still drives herself everywhere and lives with a little dog who keeps her active. She has redecorated her apartment herself several times in the past few years. And yes, she has practiced yoga postures and meditation throughout her life. Her life has not been an easy one. In 1958, my father left her for another woman after she had three children- I was two years old, my sister was one and my brother was just born. Being a woman of that time, she did not know how to drive, and had little money, as Dad was the owner of the insurance agency she helped him build. Very rapidly, she learned how to drive, went to night school, worked part time as an insurance secretary and got her agents license. My grandmother helped to raise us while she was working. When the Civil Rights law passed in 1964, large insurance companies were forced to hire women as agents, and Allstate Insurance hired her as one of the first female insurance agents in the country. This was during the “Mad Men” era where women were openly harassed in the workplace. Mom felt she needed to get married in order for the harassment to stop, even though her choices were far from ideal and not long term. She worked for Allstate for thirty years and built a very successful insurance business. Her agency still exists, with a manager now running the day to day operations. Her study of yoga, beginning in the early 60’s when this was far from mainstream, sustained her through the bad times. In 1980, she became a devotee of Paramahansa Yogananda, founder of Self Realization Fellowship, after reading his book, “Autobiography of a Yogi”. I also became a student of Yogananda and we both host a monthly meditation group for his followers. Mom is now single and happy. Like Tao, she rejects her age daily! She enjoys her children and grandchildren and loves to discuss the political discourse of the day- especially now that the topic of sexual harassment is in the forefront! I feel blessed and grateful that she is still a big part of my life.